So often we look for something new, something unique, something we've never seen before. It is exciting to be surprised by a punchline or a new style, but there is something even more thrilling in the surprise of new things that feel familiar. Kevin Henkes uses his unique style to tell a nuanced story in his Penny books. In some ways, the plot lines feel very simple (typical of any beginning reader) - but, when you really look at them, you see how cleverly he has introduced his characters and their personalities. They are reminiscent of the classic Francis or Frog and Toad stories - books that tell real stories with relatively complex characters. Penny and Her Marble is another excellent addition to the series. The third Penny book (and also the longest) follows Penny as she finds a "shiny, blue marble" in her neighbor's yard . . . and takes it home. The marble was smooth and fast and pretty - but, Penny starts to worry that it really belongs to someone else. Her internal struggle is masterfully handled as Penny tries to figure out what to do with this marble. 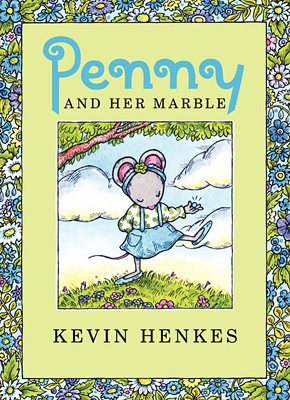 It seems unbelievable that Kevin Henkes didn't win the Geisel award last year with his first two Penny books, but hopefully he can nab it this year with Penny and Her Marble. It may not be the most flashy or loud beginning reader, but it certainly is my favorite of the year so far. This quiet story is one that will stay with you and is also completely relatable. I would think most children have, at one time or another, taken something (or found something) that didn't belong to them. We can only hope they would have a similar pang of conscience and learn from Penny. Even though these books are clearly marketed to girls (I love the flowery covers), even boys should appreciate the well-told stories and fun pictures. I've been trying to think of at least one nonfiction picture book from my childhood, but I haven't been able to come up with one. That doesn't mean they didn't exist, of course, but I can't name a single title. Perhaps the books from my youth were just forgettable, but that is not the case now. With books like Me . . . Jane by Patrick McDonnell, The Day-Glo Brothers by Chris Barton and Tony Persiani, Nic Bishop's animal books, and others, we are seeing nonfiction picture books published that are engaging, visually captivating, and certainly, memorable. Where once they may have been used primarily by teachers as classroom assignments, nonfiction picture books today are read and re-read by children who are fascinated by the stories they tell and the worlds they explore. Here's a look at three recently-published, terrific picture books. Perfect for preschoolers is Lucky Ducklings: A True Rescue Story by Eva Moore. (While it may be classified as fiction, this book is based on an actual event, so I have taken the liberty of including it in a nonfiction post.) When Mama Duck takes her five ducklings for a walk, the ducklings fall into a storm drain in their path. People in the town come to the rescue and work together to get Mama Duck and her ducklings safely home. Moore's rhythmic text repeats the ducklings' names, "Pippin, Bippin, Tippin, Dippin . . . and last of all, Little Joe," and Mama Duck's forceful, "Whack! Whack!" which makes the story a delight to read aloud. Moore sets up suspense before the page turns and pulls listeners along with, "that could have been the end of the story. But it wasn't because . . ."
Beautiful illustrations by Nancy Carpenter convey the ducks' personalities in a realistic fashion and are reminiscent of Robert McCloskey's Make Way for Ducklings. I read this book to my kindergartner and then immediately, read it again. Next up is a book for slightly older kids about an invention that most of them have probably never thought of as being invented--basketball. Hoop Genius: How a Desperate Teacher and a Rowdy Gym Class Invented Basketball by John Coy is a spirited story that demonstrates creative problem solving at its best. 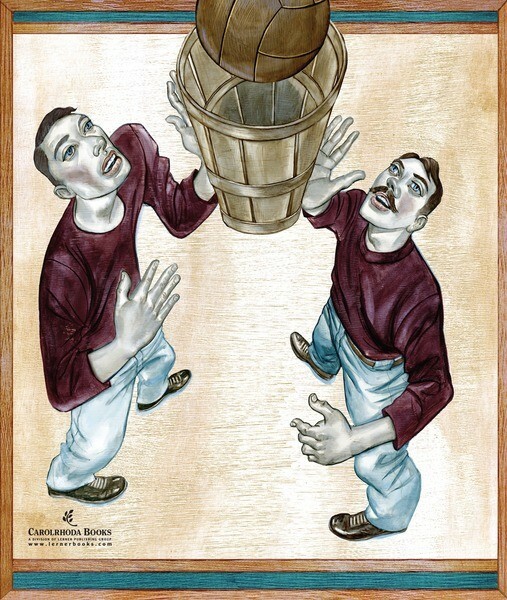 With an economy of words, Coy tells of James Naismith's attempts in 1871 to teach a rowdy gym class that no one else wanted. Since it was winter, he tried playing games indoors--first, football, then soccer, and finally, lacrosse--but the resulting injuries led him to abandon each. What he needed was a new game, and so, he invented one: basketball. Played with a soccer ball and peach baskets, the first game was so successful that when "Naismith blew the whistle to end the game, nobody wanted to leave." The story includes interesting detail, sometimes in the pictures like the attempted calisthenic and gymnastic training of the first two teachers who quit before Naismith took the class, and sometimes in the text which includes the name of the player who scored the only point in the first game. Illustrations by Joe Morse--done in a palette of maroon, blue, gray, and brown--have a distinctly 19th-century feeling. Angular, contorted figures convey the energy of the boys and the physicality of the games in full-page pictures. As an added bonus, the original typewritten rules are reproduced on the end papers. 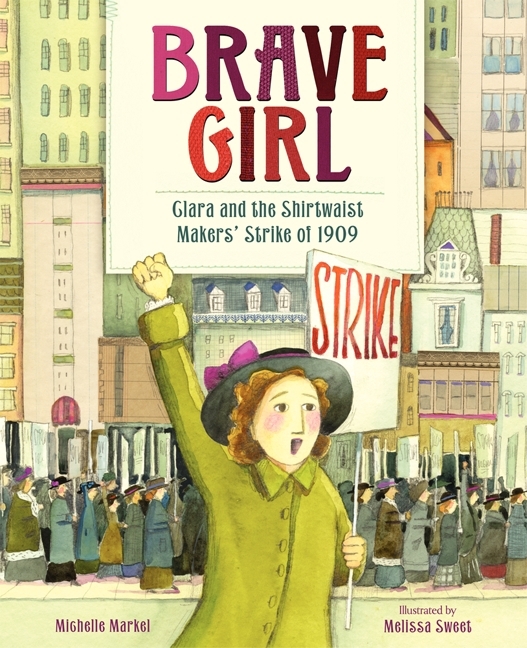 Last up is Brave Girl: Clara and the Shirtwaist Makers' Strike of 1909 by Michelle Markel, the story of one woman courageously standing up, speaking out, and influencing thousands. When Clara Lemlich immigrates to America, she finds a job as a garment worker. Conditions are unreasonable, and the details Markel provides emphasize that: half a day's wages lost for being late, locked doors, unsanitary conditions, and more. Clara's meager pay helps buy food and contributes to the rent for her family, but Clara wants something better. At night she studies in the library, and during the day she urges the girls who work with her to "fight for their rights" by striking. She is beaten, jailed, and fired, but she perseveres. Finally, at a union meeting, she calls for a general strike saying, "I have no further patience for talk" and starts "the largest walkout of women workers in U.S. history." Again, details underscore the determination of the girls, some as young as twelve, to improve their conditions. Melissa Sweet's illustrations incorporate stitching and fabric swatches, reflecting the garment workers' jobs. 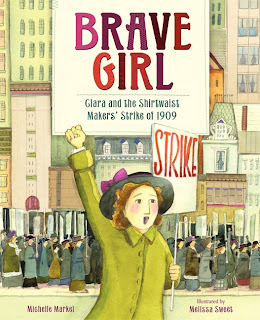 She does a remarkable job representing the power of the companies and the insignificance of the girls with a dramatic overhead view showing rows of tiny girls at their machines and another picture of the large Triangle Waist Company building, which gives even more weight to Clara's efforts. The opening picture of people looking toward the Statue of Liberty from the ship arriving in New York harbor is echoed in the final picture of Clara looking from the shore toward the same statue, bringing the story of a hopeful girl who finds out America can be unfair, full circle as she regains faith in her new country. History brought to life with an engaging text and captivating illustrations--this is memorable. 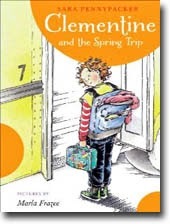 If you love the Clementine books by Sara Pennypacker, or if you've never read them, check out the newest addition to the series -- the sixth (and second to last) book, Clementine and the Spring Trip. In spring, when the weather warms up, the students at Clementine’s school go on field trips. This year the third and fourth graders are going to Plimoth Plantation, and third-grader Clementine and her dirt-phobic friend, fourth-grader Margaret, agree to be partners for the excursion. Clementine will “touch anything that looks filthy” so that Margaret doesn’t have to get dirty, and Margaret will help Clementine figure out how to eat quietly--a necessity for the trip because the fourth graders have a strict silent-eating rule, but their plans fall apart when Clementine’s teacher assigns her to partner with the new girl at school, Olive. He assures Clementine that he knows she will make Olive feel comfortable. On the trip to Plimoth Plantation, Clementine spends time with a chicken and decides that she cannot eat her quiet chicken sandwich for lunch. When Olive offers to share her lunch of humus, pita chips, celery sticks, and apples, Clementine knows the fourth graders will go crazy when Olive takes her first bite, so Clementine breaks the silent-eating rule as loudly as she can. Soon others join in, gulping, crunching, and snicking, and Clementine discovers she can make her own rules. The story comes to life told through Clementine’s voice which is fresh and third-grade perfect (with the charming exception of knowing more unusual vegetables than any third grader I have met: mung bean, watercress, Swiss chard, kohlrabi). She is independent, thoughtful, and dramatic. Vivid imagery gives the reader a chance to experience life as Clementine sees it: “eyelids snapped open like cartoon window shades”; the chicken “was so pretty that it could have been a chicken-shaped sugar cookie-one that was all speckled with butterscotch sprinkles and had a red-frosting Mohawk on top of its head”; and she describes herself as being like a Clementine with “lots of different sections” (89, 85, 110). Her description of Principal Rice’s shoes as “car seat shoes” is accurate and hilarious (101). Spot pictures by Marla Frazee (several per chapter) complement the text and add to the energetic mood of the story.